Our dog Harper found a box turtle in the hay pasture this week, which was a very exciting find. 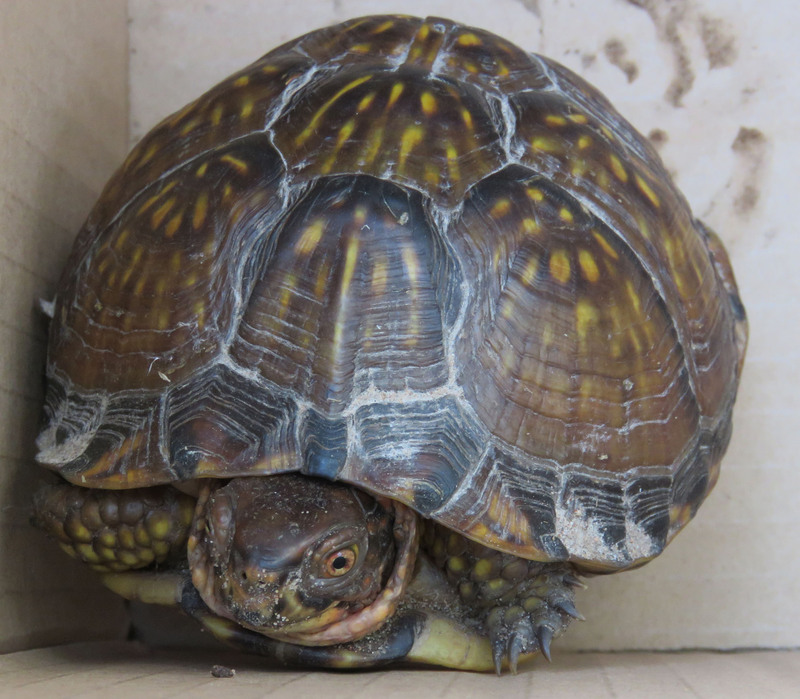 While we have dozens of pond turtles, (tons of Red-eared Sliders, and a few, rarely seen Common Snapping Turtles), box turtles have gotten so rare in Texas that we are asked to report sightings. This is only the fifth I’ve seen in the seven years we have lived here. This week’s find on the left, a turtle from 2012 on the right. Harper found it also, in a wooded area of the farm. 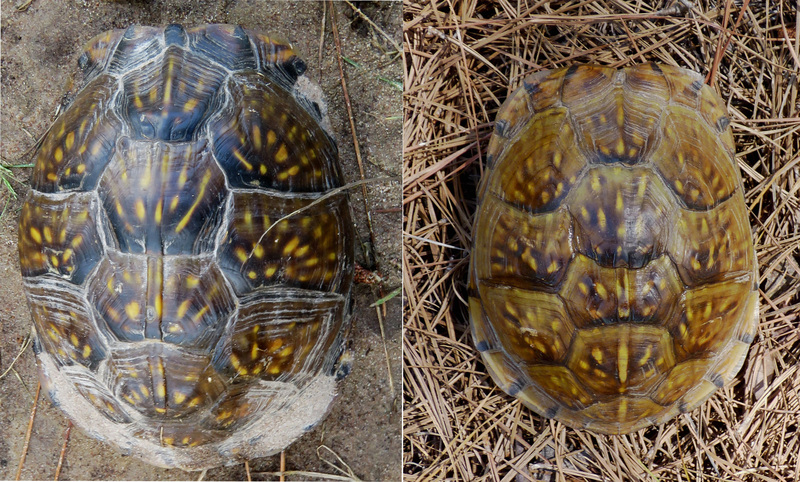 Now I thought I’d been taught that the patterned ones are Ornate Box Turtles, and the plain ones are Three-toed Box Turtles, but looking around on the internet, it seems that Three-toed are a sub-group of Eastern Box Turtles, and some of the pictures of them show similar patterns to the ones pictured above, so now I don’t know if I know what I thought I knew! It is their back legs that have the three toes, and since I can never get them to emerge fully from their shells, I have not had opportunity to witness any back toes. 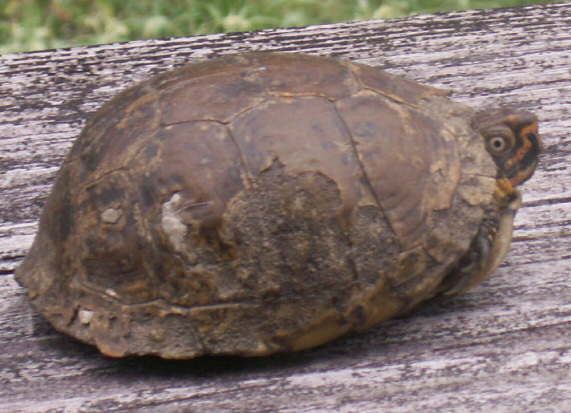 If you can offer any information about Texas turtle species differentiation, I would be happy to hear it. 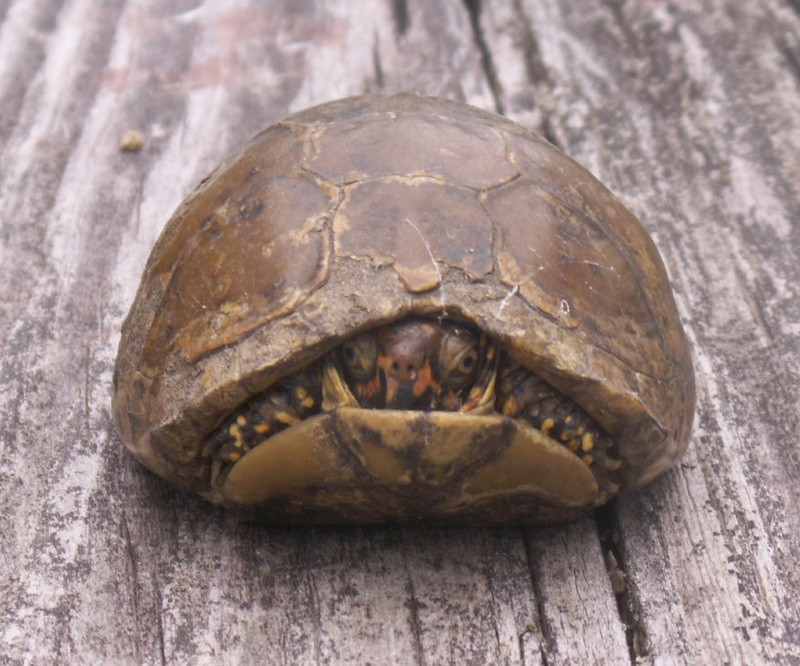 A box turtle with evidence of a hard life, from 2009. The most amazing thing about box turtles is that they can live their whole life in an area the size of a football field! And that life is pretty long, thirty to forty years, with some even reported to 100 years. I immediately called neighbor EcoCaty who loves turtles. We decided to release this one on her property instead of mine, because we were worried it might get mown or squished when the hay is baled. Giving us the stare of turtle wrath. The males have red eyes and the females have yellowish-brown, so whether these pictures show representatives of two species, or whether they are just variations in one species, I am going to boldly classify both of them as females. What an exciting sighting! The turtle is so beautiful 🙂 How big are they?